Need a way to occupy the kids when it's too cold to go outside? Or maybe it doesn't get cold where you live (can I come stay with you until June?) but you still want to celebrate winter. 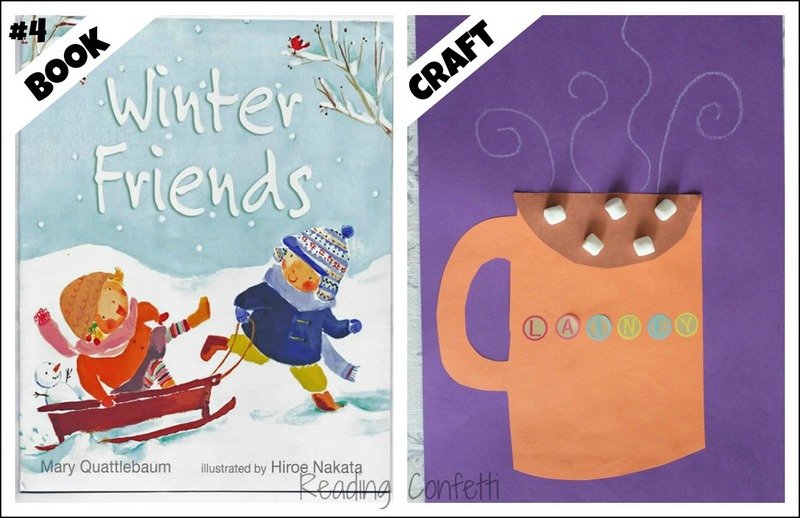 Stay busy and have fun learning with these 25 winter books and craft projects for preschoolers and beginning readers. Book: Winter Trees: A boy and his dog stroll through the winter forest discovering seven different types of trees. A fun early introduction to tree identification and a great way to encourage appreciation for nature. 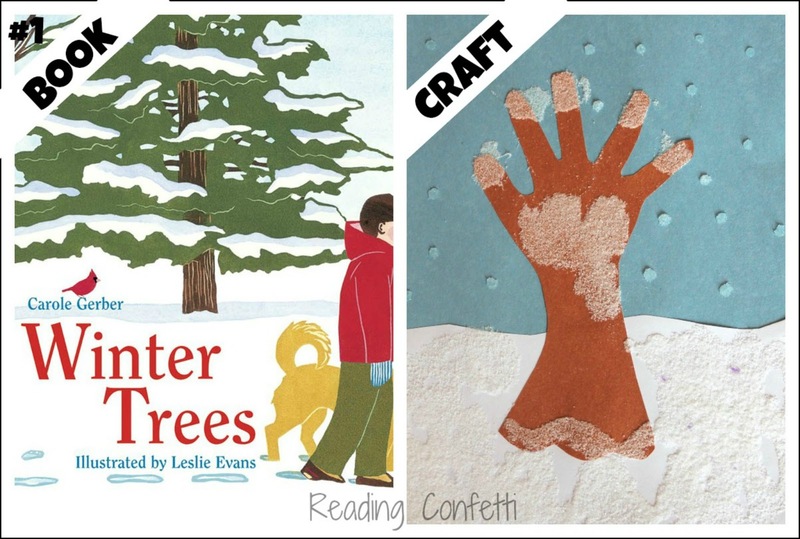 Craft: Make a snowy handprint tree from Kaboose. Book: Hooray for Snow! is about three little squirrels eager to play in the snow. Papa doesn't want to join them because it's too cold and Mama has too much work to do. After they convince Papa to come out, he discovers that sledding is too much fun to worry about being cold. By the end of the book they also convince Mama to join them. 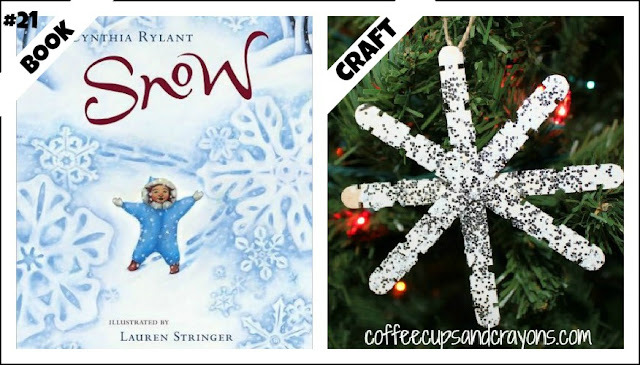 It's a simple book celebrating the joy of winter and playing in the snow. 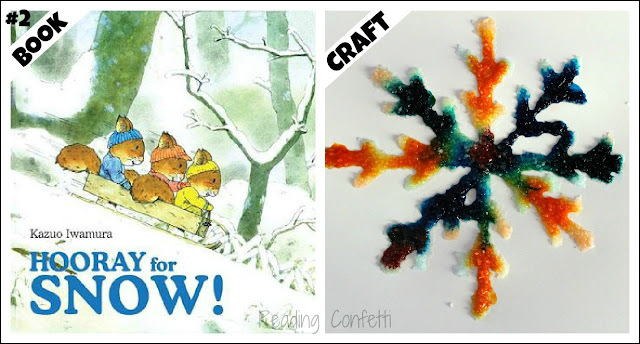 Craft: Combine a craft and science experiment by making rainbow salt snowflakes. Book: Snow by P.D. Eastman celebrates all the fun things you can do during the winter. Eastman's rhyming verse is written in the style of Dr. Suess. 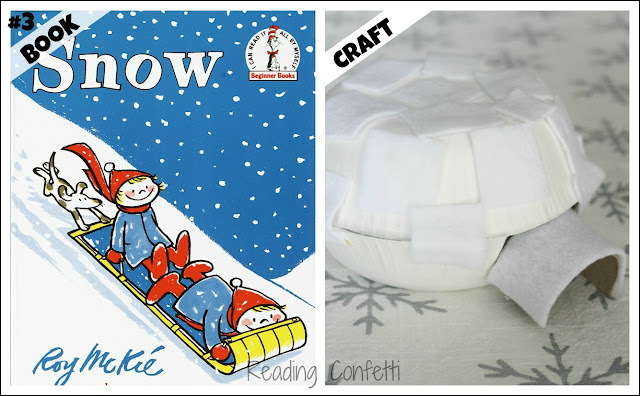 Craft: Construct an igloo from a disposable bowl. The idea came from Nuture Our Child, but we modified it to use materials we had: two paper bowls, half a toilet paper roll, and white felt. Book: Winter Friends is a book of short, fun to read poems with winter themes including the title "Recipe for a Party", which describes making hot chocolate for friends. Book: A Penguin Story : Unlike the other penguins, Edna is looking for more than what life is currently offering her - white, black, and blue. When she finds more color, it inspires her to dream even bigger. 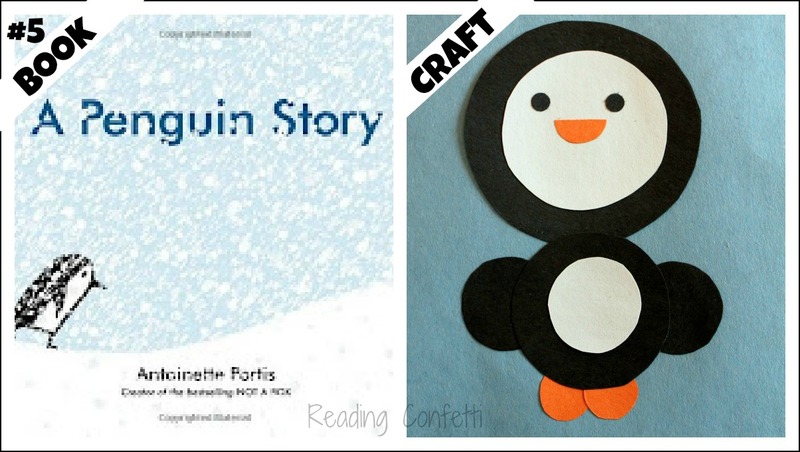 Craft: Practice fine motor skills while creating a circle penguin. Book: Over and Under the Snow: A girl and her father ski through the winter trees. Though it's mostly still and white, they catch glimpses of wildlife and she becomes aware of all of the animals hidden and safe beneath the snow. Book: Flip and Flop: Flop is a penguin whose big brother, Flip, doesn't want to play with him. Luckily he finds Hop who is in the same situation with Hip. They play together until they discover a game that all four can play together. 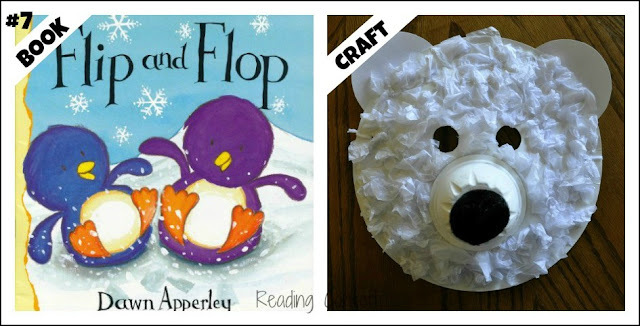 Craft: Make polar bear masks from I Heart Crafty Things and penguin masks from Play Pennies to reenact the story. 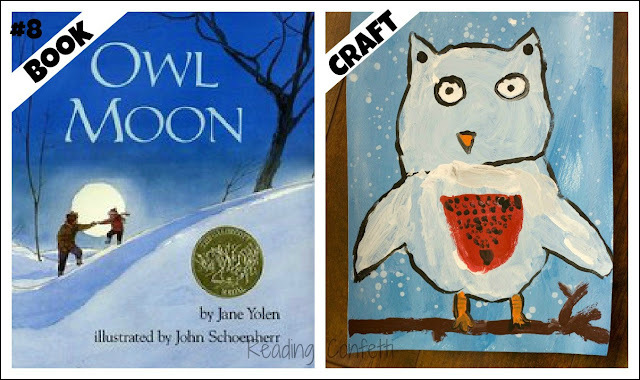 Book: Owl Moon: A walk in the moonlight becomes something magical when seen through the eyes of a child. The poetic language and beautiful watercolor illustrations make the reader feel as though they're going owling in the nightime forest right along with the young girl and her father. Craft: Make some of these adorable snow owls from Deep Space Sparkle. Book: Is That You, Winter? : Old Man Winter wakes up crabby. After he does his job of spreading snow and cold, he wonders why he bothers. Then he stumbles and a little girl takes care of him. By the end of the book, he's happy knowing who is enjoying all his hard work. The art is done in a messy splatter style that's a lot of fun to look at. Craft: We made our own messy illustrations on snow using homemade snow spray paint. Book: The Mitten Tree : A lonely elderly woman watches the children at the bus stop each day. One wintery morning, she notices a boy who doesn't join in the snow play because he has no mittens. The kind woman knits him a pair and leaves them hanging from a tree for him to find. She continues knitting mittens for the kids and is surprised with a kindness in return, a basket of yarn left on her doorstep. 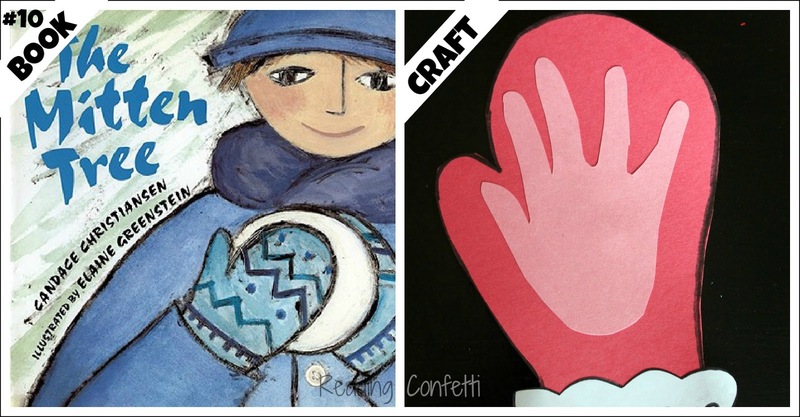 Craft: Make a handprint mitten from House of Baby Piranha. Book: Curious George in the Snow: Everybody's favorite monkey is hitting the slopes. Craft: Though your little one might not be quite ready for the ski jump, they can make ski jump art with a tutorial from Kaboose. Book: Counting on Snow counts down from 10 to 1 using different arctic animals. As the animals decrease, the snowflakes increase. Book: Tacky the Penguin is different from the other penguins. But when Tacky saves the day, everybody learns to appreciate his differences. I love the message in this book. 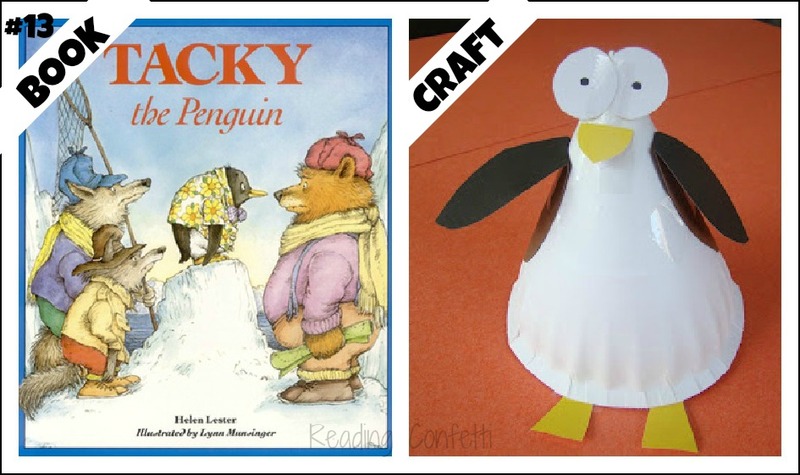 Craft: Make your own tacky penguin. Book: Snow Day! : Sam, Pam, Will, and Jill are alligators who like to play in the snow. When they realize they have to go to school, they do something surprising. Simple, repetitive fun. 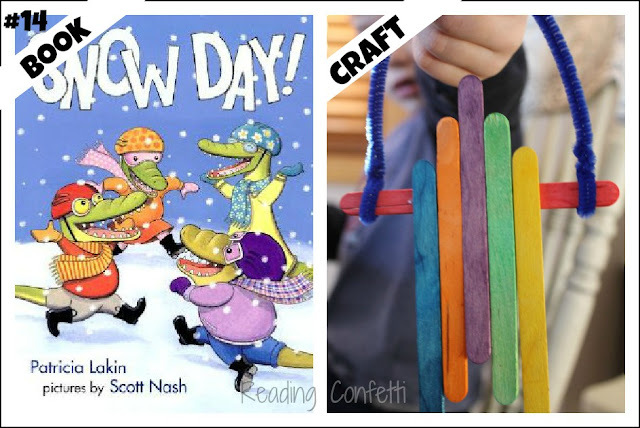 Craft: Make a sled from craft sticks. There are lots of tutorials for these but I like the one at the Studio because it's easy enough for preschoolers to manage with little help. Book: Stella, Queen of the Snow: During his first snowstorm, Stella shows her little brother Sam all the wonders of winter. Craft: Create a snowy day collage with marbles from First Palette. Book: All You Need for a Snowman : In rhyming, repetitive text the book lists all you need to make a snowman. It starts with a small snowflake and builds. Excellent book to read aloud. Craft: I love this snowflake snowman craft from Teach Preschool and it goes along with the book perfectly! 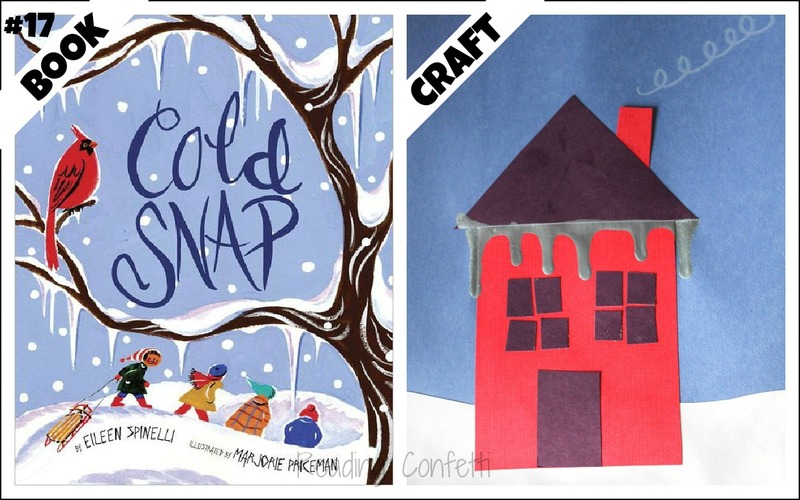 Book: Cold Snap: Freezing cold weather brings the community of Toby Mills together. Winner of two book awards in 2012. Book: Snow is a simple book about how all the animals are getting ready for the first snowfall. 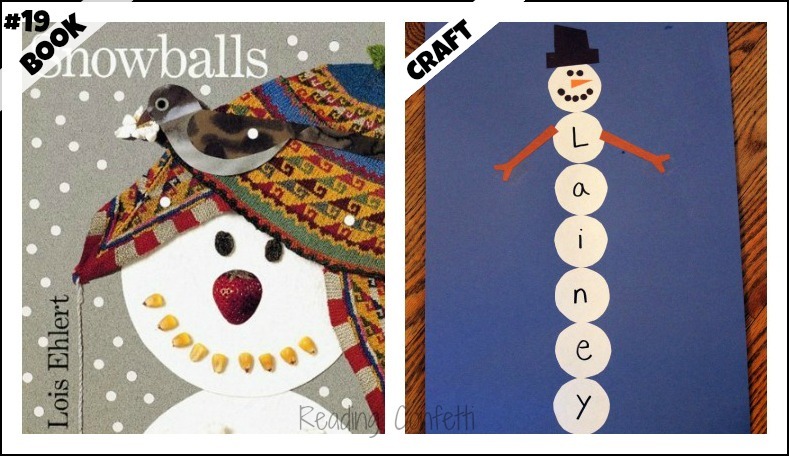 Book: Snowballs : Children take advantage of a perfect snowball day to build a family from snow using creative materials. Lois Ehlert's collages always offer plenty to look at. Craft: Create a name snowman (idea from Under the Big Top). 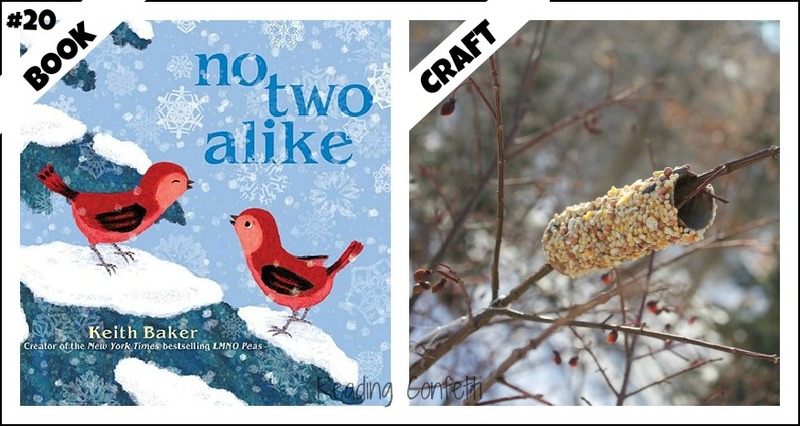 Book: No Two Alike: In rhyming verse, this book follows two birds as they explore the winter landscape. The gorgeous illustrations help illustrate that though things may seem similar, everything and everyone is special and unique. Craft: Smear peanut butter on an empty toilet paper roll and press in bird seed. Slip the roll on a tree branch to give the birds a winter treat. 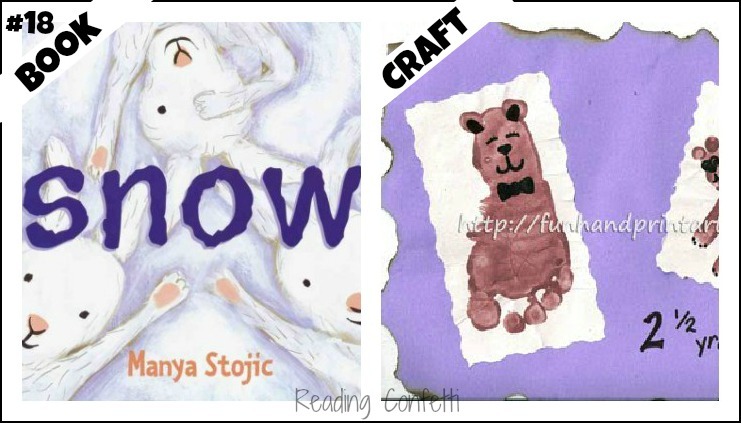 Book: Snow : Written by one of my favorite authors, this book is truly a celebration of snow. There's the snow that makes you want to run out and play in it. There's heavy snow and light snow. The author also describes how each kind of snow makes you feel. 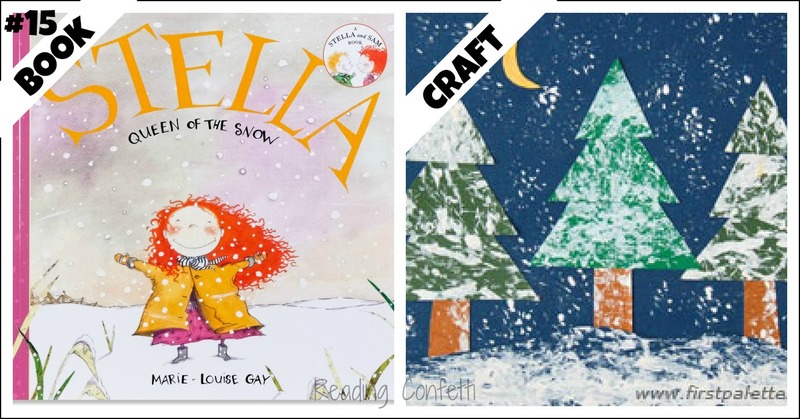 This book captures the joy and excitement that children experience whenever they see snow falling. Craft: Make popsicle stick snowflakes. Check out all the fun versions at Coffee Cups and Crayons. Book: The Snowy Day is the classic about a little boy's adventures on a winter day. Waking to find his world blanketed in snow, Peter sets out to experience it. He makes tracks, knocks snow off branches, builds a snowman and goes sledding. A simple story about the simple joy of being a child in winter. 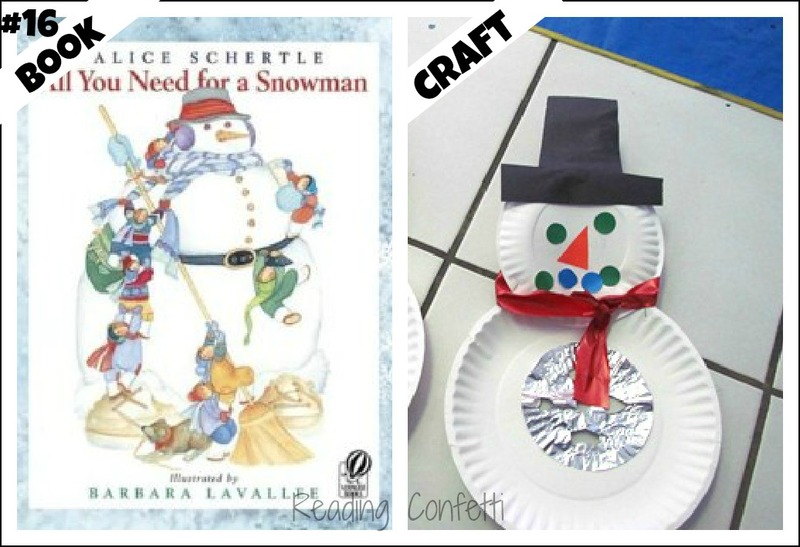 Craft: Make a snow angel indoors using a paper plate (from Preschool Crafts for Kids). Book: The Mitten is based on a Ukranian folktale about a boy with a pair of snow white mittens. He loses one of the mittens in the snow and several woodland animals find it. A rabbit, a bear, a fox, and several others snuggle inside it. When a little mouse squeezes in and tickles the bear's nose, he gives a great sneeze and all the animals and the mitten go flying. It's silhouetted against the sky and the boy finds his mitten. Craft: Put the animals inside a mitten made from a white paper bag. Book: The Winter Visitors is a mostly wordless picture book about what happens when humans leave their summer cottage and a family of bears take up residence. Each humorous illustration shows the bears engaging in a fun activity like jumping on the bed and eating all the honey. They even throw a New Year's Eve party and invite all the woodland animals. When the summer visitors return, they don't suspect a thing. Craft: First Palette shows you how to make a bear from circles. Book: Katy and the Big Snow : Katy is a brave little tractor. She finally gets her chance to shine when a blizzard covers the city with snow and Katy comes to the rescue with her plow. 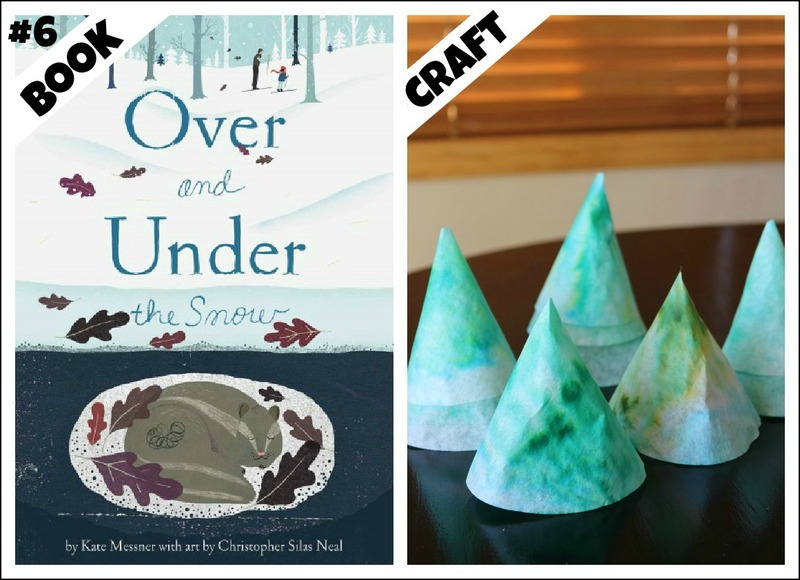 Craft: Make a 3-D snowplow from shapes. What a great collection of books and activities and lots of books we haven't read! Will have to bookmark this for when we have Winter or perhaps I should read some now to convince myself it isn't so hot! Great collection! I really like how you paired the books and crafts. Thanks for sharing! This is an amazing list you've put together. I'm really so impressed. I'm definitely pinning it...it will keep us busy until spring! (A few weeks ago, I was looking for a simple igloo craft and didn't find anything like what you made. We are going to try it!) Thanks again! Wow, what an amazing list and with a craft to go with it too. Thank you for sharing. Love how your organized this post with the pictures of the book and craft next to it. What a great idea! What a wonderful list! Thank you for sharing. This is a great collection of resources. I'm pinning it for the library! You have such great ideas on your blog, I'm so glad you've collected them all in one place! What amazing crafts! I love the variety of different art ideas you used. Many of your books are favorites. I will be sharing this post on the Read.Explore.Learn. Facebook page today. Love all your ideas. 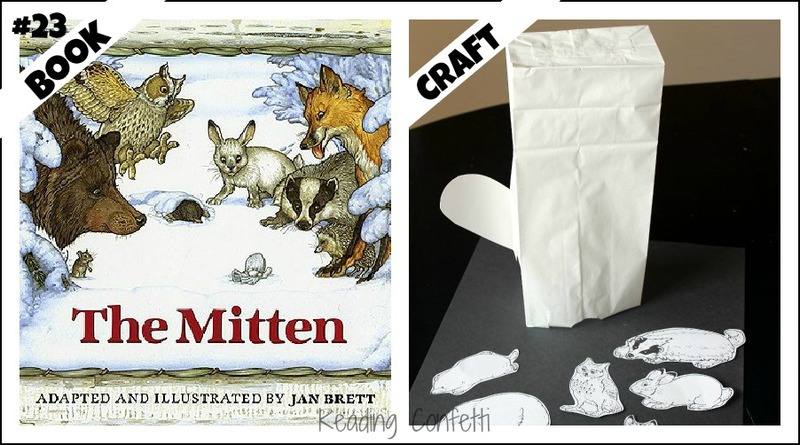 I can't wait to read The Mitten Tree. It sounds so sweet! I just wish we would get some snow already here in the Midwest! Just one word - Awesome Resource! and another - Thank you very much! amazing & so glad you shared this on The Sunday Showcase! We just made salt snowflakes last week and my girls LOVED it. Pinning this to our SS board. these are all amazing! now I see many books i want to get the kids:) thanks for linking up to the ATK winter books series this month.